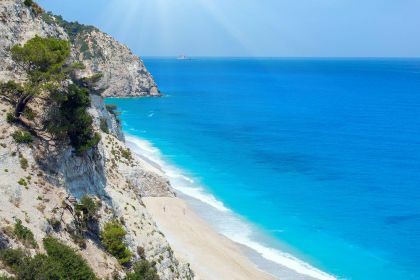 Lying in the Ionian Sea and connected to the mainland by a causeway, Lefkada is an unspoilt Mediterranean paradise. 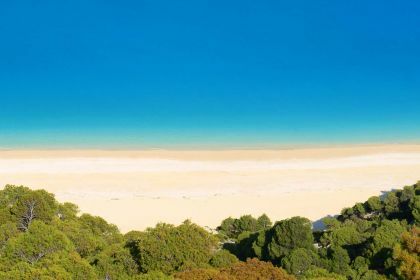 Edged with white cliffs lapped by electric-blue water and clad in olive groves and cypress trees, the island offers both top-notch, developed tourism as well as wild, secluded nature spots. 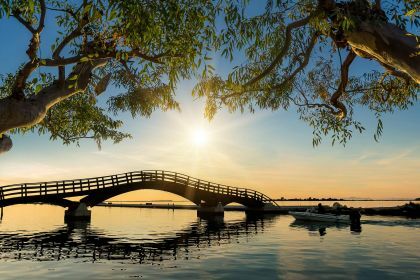 While most of the tourist action occurs on the east coast, dropping anchor off the dramatic west coast will afford you privacy and the luxury of having the azure waters to yourself. 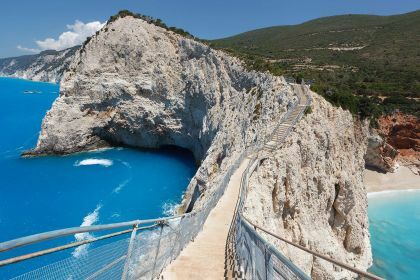 If you fancy wandering ashore to try some of Lefkada’s cuisine, head to the traditional village Nydri, Lefkada town in the north or breezy Vassiliki in the south. After relaxing onboard your luxury yacht, you might also be up for some more strenuous exercise. A hike to the wild centre of the island will reward you with a glimpse into age-old traditions: shepherds tending sheep, farmers checking their orchards and groves and old crones in traditional dress. 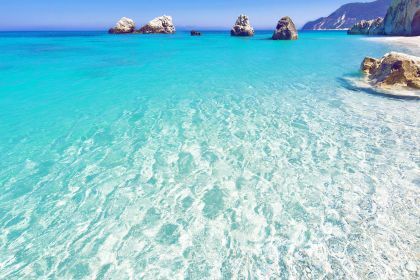 The beaches of Egremni, Milos, Gialos and Porto Katsiki are encircled by steep cliffs and reaching them often involves crazy traffic, hairpin bends and a frantic search for parking. That is, if you’re not being pampered aboard your own chartered yacht. You have the luxury of sailing to them, dropping anchor and swimming in the azure water. On the east coast, you may want to go ashore and hike to the Nydri waterfalls, a series of cascading drops and refreshing pools in which to swim. For a steeper climb, consider visiting Lefkada Monastery Of Faneromeni, near Lefkada town, where there are lovely gardens, ornate frescoes and beautiful views of the island and mainland. You can sail into the harbour at Geni and be sitting at a table at Seaside Restaurant within minutes. With its stunning views of Vlyho Bay and delectable modern Greek cuisine, it’s a popular place for yachters and those who recognise a top-notch seafood eatery. Roots restaurant, on the beach at Nydri, is a great option if you fancy a change from the usual Greek fare. Try the pesto spaghetti or the rib-eye steak and then sink back in your chair and absorb the stunning mountain and sea views. As for sweets, Lefkada is famous for its honey and marmalade – don’t miss them if you have a sweet tooth! Art Club in Lygia might not be the most chic bar, but what it lacks in refinement is more than made up for by its festive vibe and friendly owners. Sea to See café and bar, in Lefkada town, offers plush, vintage-style décor and outside tables next to the canal – a great place for a sundowner. The tiny Tree Bar, set in the grounds of the Athos Hotel in Nydri, is a stylish spot for a cocktail. 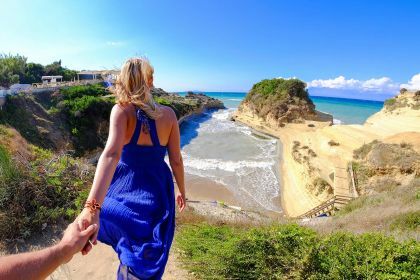 Ready to explore the beauty of the Ionian islands? Contact our charter broker, or call us or complete the contact form. Insider Tip: Make sure you carry cash, as very few establishments accept cards and the ATMs in the larger towns are sometimes out of order.